Recently China announced a hike in its defence budget by 11.2 per cent for 2012. The increase will bring official outlays on the People’s Liberation Army (PLA) to U.S.$110 billion for 2012, after a 12.7 per cent increase last year and a near-unbroken string of double-digit rises across two decades. Beijing’s budget is widely thought to understate (and undercount) its real spending on military modernization. It is believed that it spends nearly twice the publicly stated outlay. On the other hand, the profligate U.S. is trimming its defence budget; for 2013, Washington's approved defence outlay is U.S.$525.4 billion, about U.S.$5.1 billion less than the 2012 outlay. However, it often shoots up by a couple of hundred of billion dollars, mainly to fund its war efforts in Afghanistan and the Global War on Terror. In the third week of March, India announced its defence budget for 2012-13 at U.S.$41 billion (Rs 1.93 lakh crore), a 17% increase over the previous year figure of U.S.$36 billion (Rs1.64 lakh crore). The increase in allocation reflects the sense of urgency in New Delhi to upgrade its military infrastructure in the wake of the twin threats from China and Pakistan. In fact, India has recently emerged as the world's largest importer of arms, displacing China from the top position. It is not that China is buying less; rather China is enhancing domestic production capability by producing much-needed defence equipment at home. 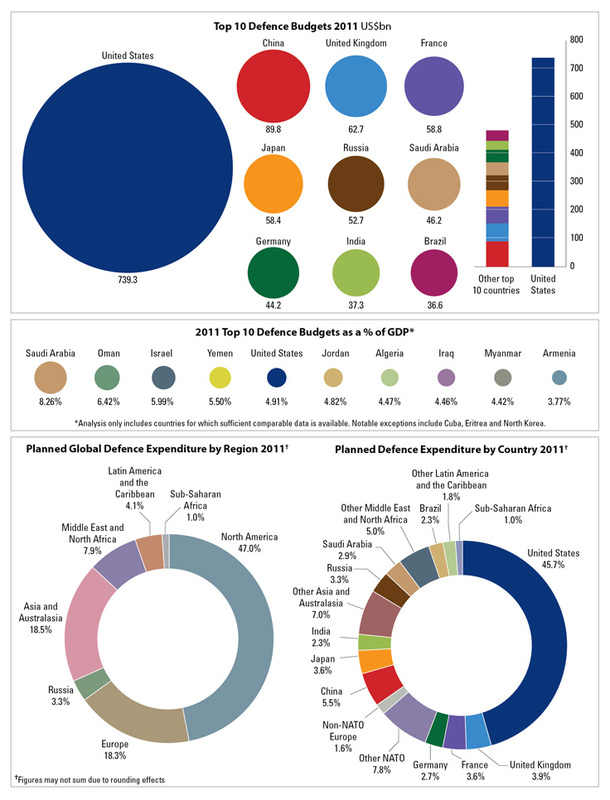 In this regard, check out this awesome infographic from The International Institute for Strategic Studies on global defence outlays: in short, who is spending the most in absolute terms and in 'as percentage of GDP' terms. Labels: China, India, Infographic, Pakistan, Politics, Terrorism, U.S.